The governor of Yamal-Nenets Autonomous Okrug Dmitry Artyukhov published photos from the nuclear-powered icebreaker “50 Let Pobedy” on his pages in Instagram and Vkontakte. The conference on development of the Northern Sea Route was held on board of the icebreaker. “A sense of pride for our country! In the next 5 years the cargo traffic on the Northern Sea Route will increase greatly. And Sabetta will be its heart”, the head of the region wrote. He thanked Deputy Prime Minister Yuriy Trutnev, the Chairman of the Marine Board Yuriy Borisov, the Minister for development of the Far East and the Arctic Alexander Kozlov, Rosatom for the significant discussion. 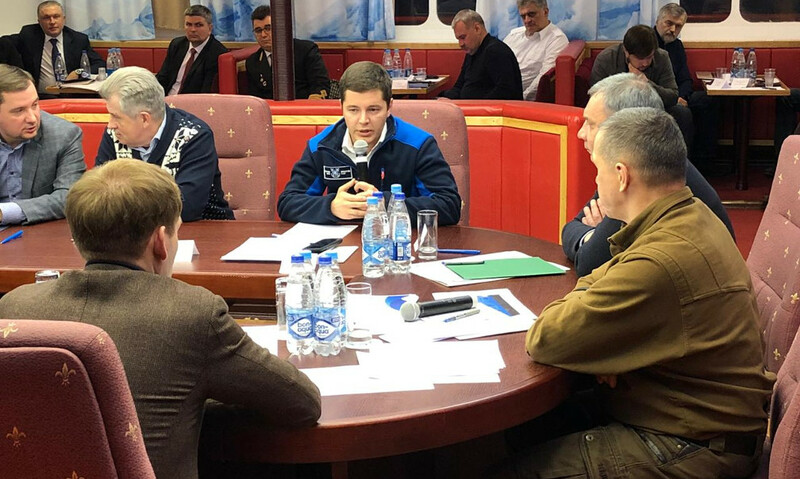 As we should remind, Dmitry Artyukhov told about development of the Northern Sea Route and its significance for Russia on the 5th of April at the meeting with journalists. According to him, in the long term the Northern Sea Route can become an alternative to existing trade routes. “It is already beginning to happen before our eyes. Last year our record on the Northern Sea Route exceeded 20 million tonnes. It has never happened before. This figure is three times higher than the best result in the Soviet Union: in 1988 or 1989 six-something million tonnes. And we have 20”, Artyukhov said. He underlines that the task set by the President — to bring the cargo turnover on the route up to 80 million tonnes — is not easy, but achievable. “80 million tonnes is quite a serious figure. It is important that 70% of them are our Yamal projects, which will make the most considerable contribution to solution of this task”, the governor of Yamal-Nenets Autonomous Okrug said.